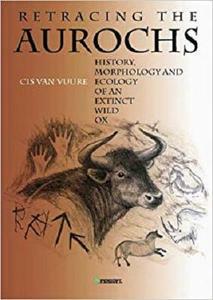 This book tells a comprehensive story of the extinct aurochs (Bos primigenius), the wild ancestor of our domestic cattle, and of what is still left of it. Not only until its extinction in 1627, the aurochs, because of its appearance and nature, had left a deep impression on people, but also afterwards this bovine species, due to scanty information and questionable interpretations, has been subject to discussion and mystification. In spite of a growing amount of individual scientific studies, no exhaustive overview on this subject has ever been made. After many years of research at the Wageningen University, the existing information as well as numerous new or unused data from the fields of archaeozoology, history, philology, modern and palaeo-ecology have been brought together by the author to build up a complete picture of the physical appearance, the way of life and the environment of the aurochs. Directly related to the ecology of the aurochs is the ongoing discussion concerning the supposed impact the large herbivores render on forest structure, as well as on the appearance of the natural landscapes they live in. Here, too, the existing and new surprising data from various fields of science are compiled to elucidate this problem. In addition, due attention is paid to the origin, description and evaluation of the so-called bred-back aurochs (Heck cattle), used in several places for educational and nature conservation purposes. Only now can Heck cattle be properly compared with the original aurochs prototype. The book is addressed to specialists in theriology (interested in the archaeology, ecology, morphology and history of mammals), palaeoecology (because of the herbivore-impact debate concerning the former natural landscape), forest ecology and European nature conservation, to cattle breeders and other cattle lovers.